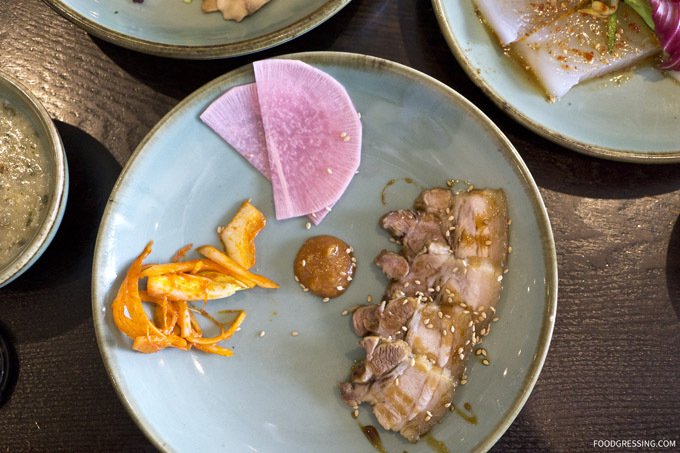 Newly opened in the West End neighbourhood is Ta Bom Korean Fusion Cuisine. 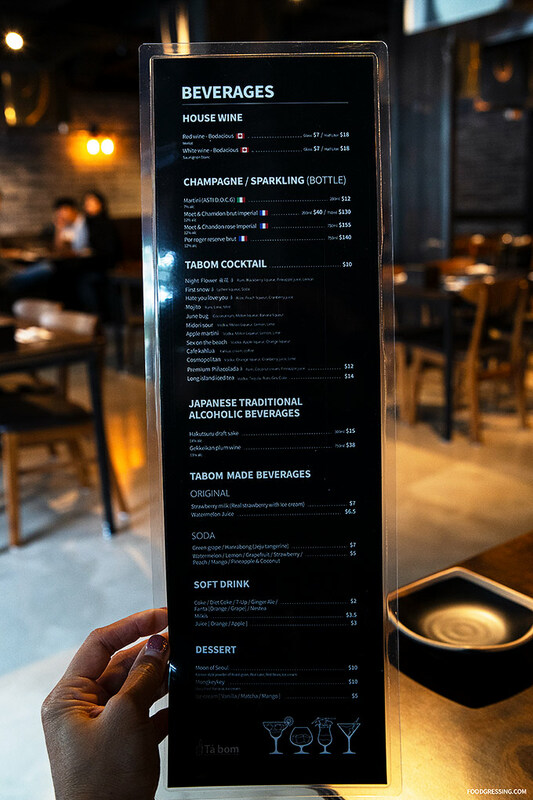 Located at 1536 Robson Street (between Nicola and Cardero), this is Ta Bom’s second location with their original restaurant in Coquitlam. 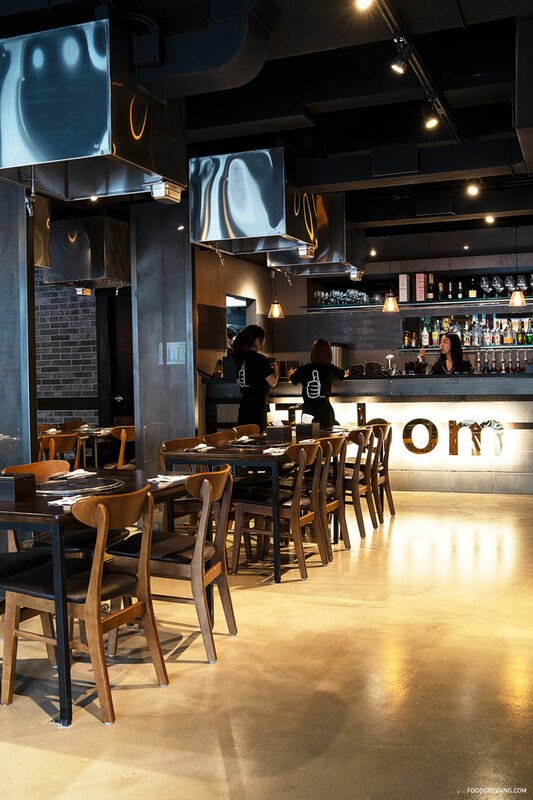 I never made it to Coquitlam to try Ta Bom but I had heard positive reviews from other food bloggers who had dined there and enjoyed the experience. They made an announcement on Instagram of their soft opening this past Friday at 5 pm. 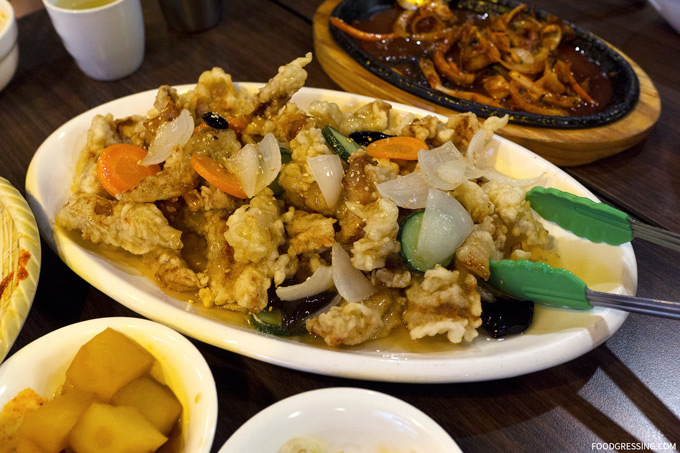 With much eagerness, I took my family for dinner there just after they opened their doors. Here’s a look at what they are offering and our experience there. 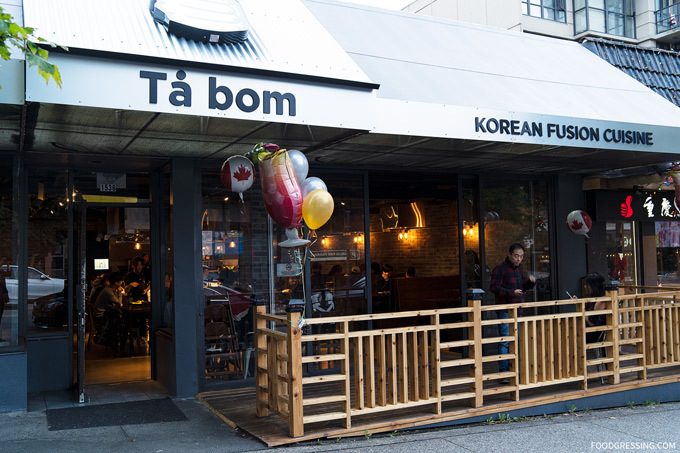 Ta Bom is reported to be almost double in size of the Coquitlam location. The space is over 2,500 square feet and can accomodate 80 – 100 people. 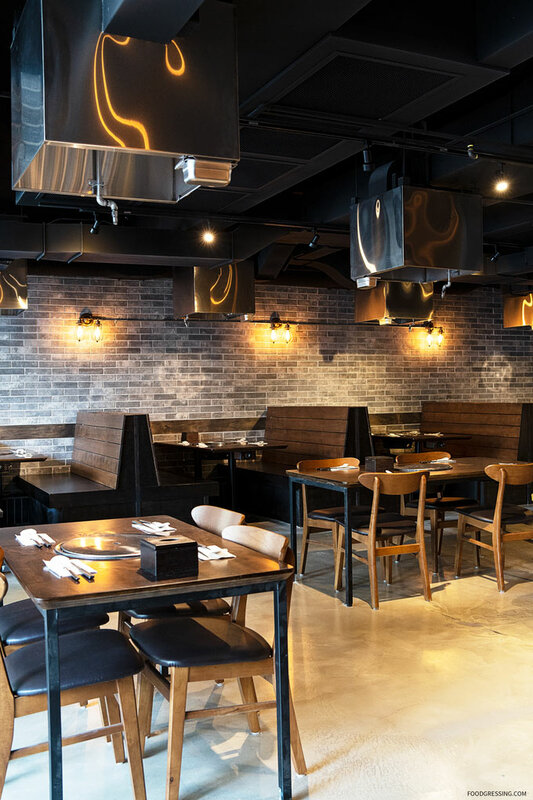 I enjoyed the modern interior with exposed brick walls and a mix of dining tables and booth seating. 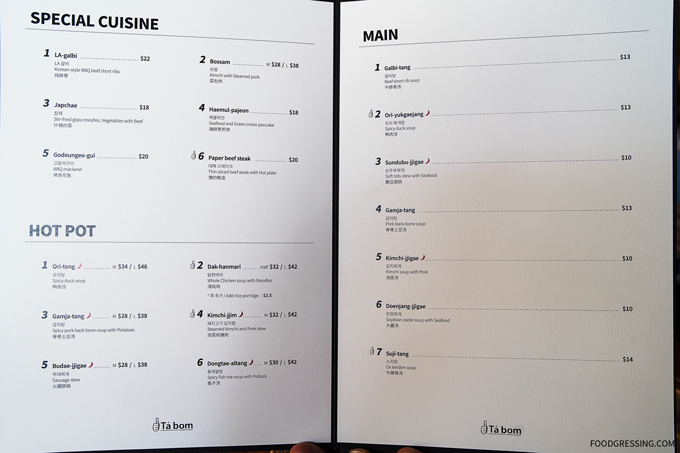 I have included photos of the menu below but for a higher-resolution of them download my compiled pdf here (large). 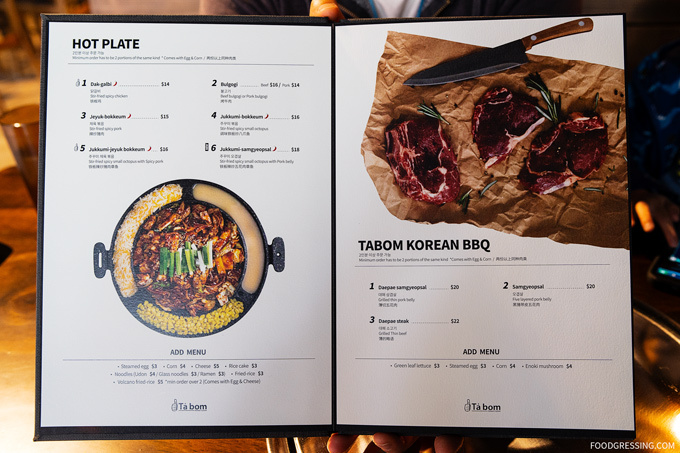 Tabom is known for their circular hot plates featuring choice of main dish (meat or protein – minimum 2 orders) along with side dishes. 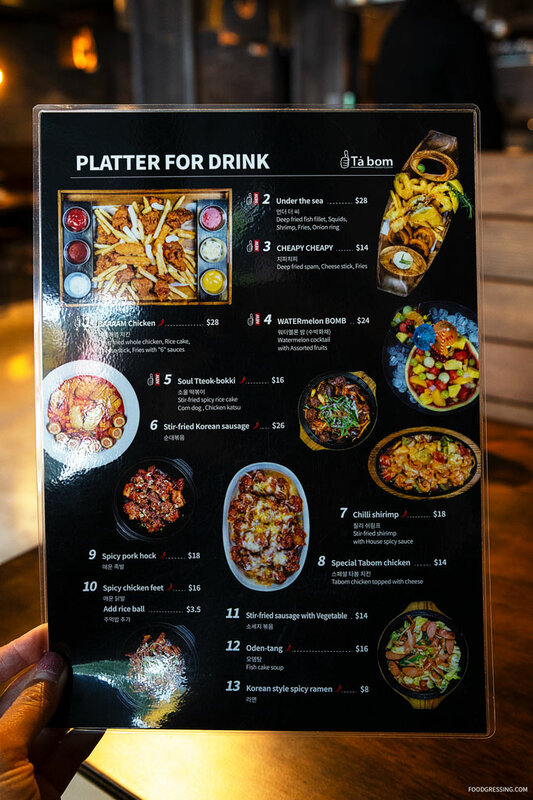 Meat options include dak-galbi (stir-fried spicy chicken), jeyuk bokkeum (stir-fried spicy pork), jukkumi-jeyuk-bokkeum (stir-fried spicy small octopus with spicy pork) and more. 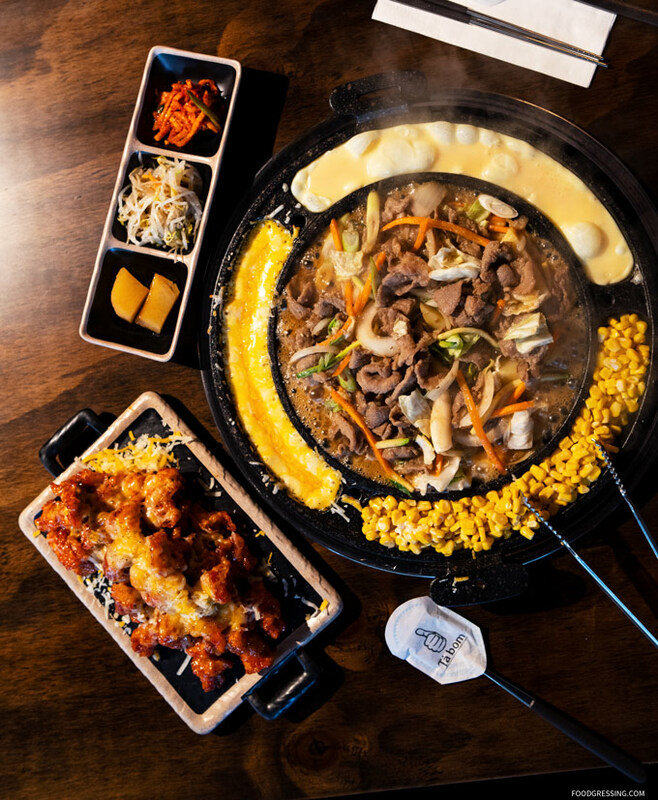 The hot plate already comes with egg and corn but you can order additional side dishes like rice cake, noodles, fried-rice and so forth. 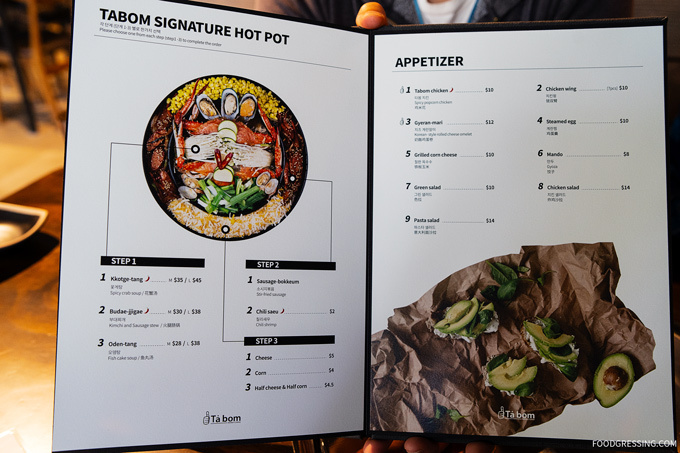 Also on the menu is the Tabom Signature Hot Pot, Korean BBQ, appetizers, stone bowl rice, noodles, platters, combos and so forth. Ta Bom Robson also serves a variety of beverages including house wine, champagne, cocktails, Traditional Japanese alcoholic beverages, and other house-made drinks. We had the bulgogi (pork) hot plate ($28) with cheese (+$5), corn and egg. For banchan (side dishes), we were provided kimchi, bean sprouts and potato. The pork was nicely tender and the soup base was flavourful and on the sweeter side. The corn was also reasonable being juicy and sweet; I’ve had a bad experience before at a ramen restaurant (see post here) where the corn was not properly defrosted. 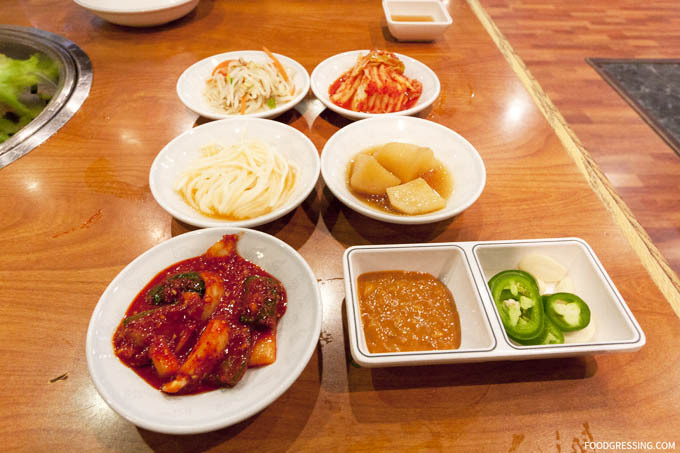 The side dishes seem a bit limited in terms of selection and portions compared to what other Korean restaurants offer. The potato was not very good as it was very hard. 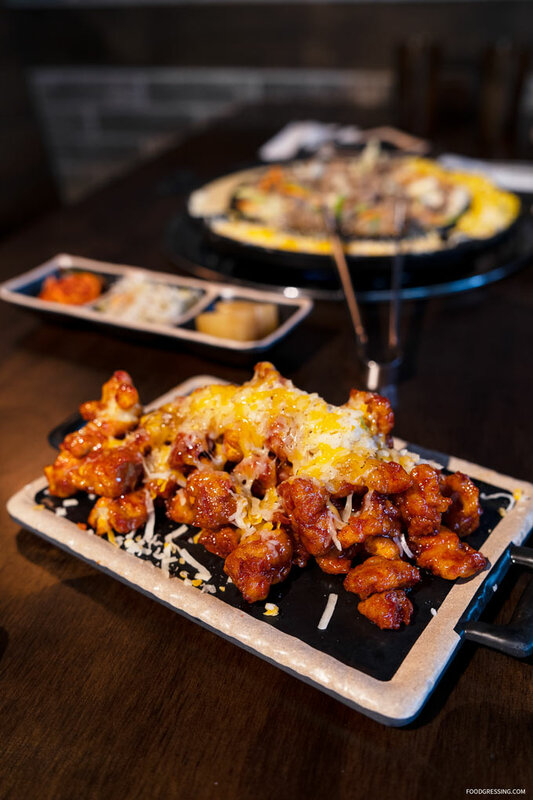 We also had the Tabom Chicken which was a spicy popcorn chicken topped with cheese. The chicken had a nice flavour being mildly spicy and the texture was also very good being tender and juicy. Things were off to a good start when we were the first customers in the restaurant. It was pretty empty at that time and the servers were quite attentive. As the restaurant got busy, the service we received really suffered. 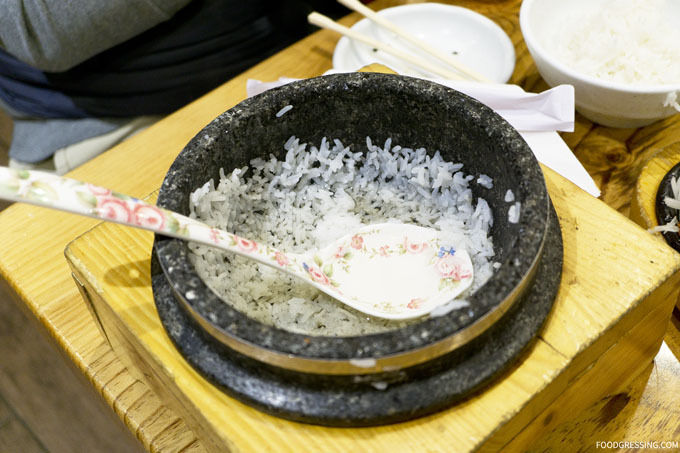 In fact, we had originally ordered a Volcano Rice which was meant to be mixed in with the main dish and soup base on the hot plate sometime closer to the end of the meal. 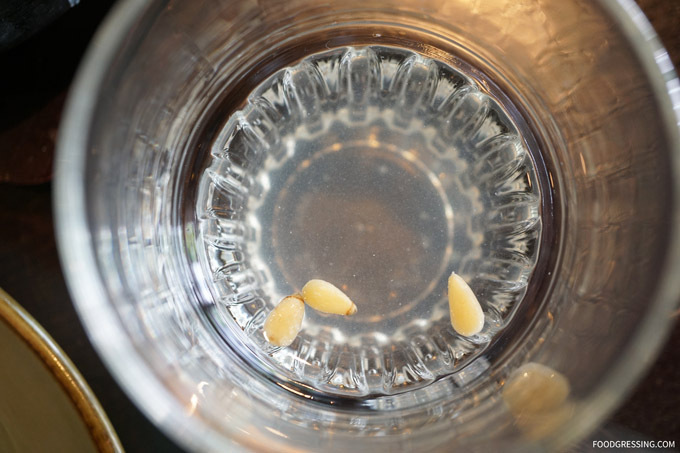 The rice didn’t arrive in time before the soup base caramelized. 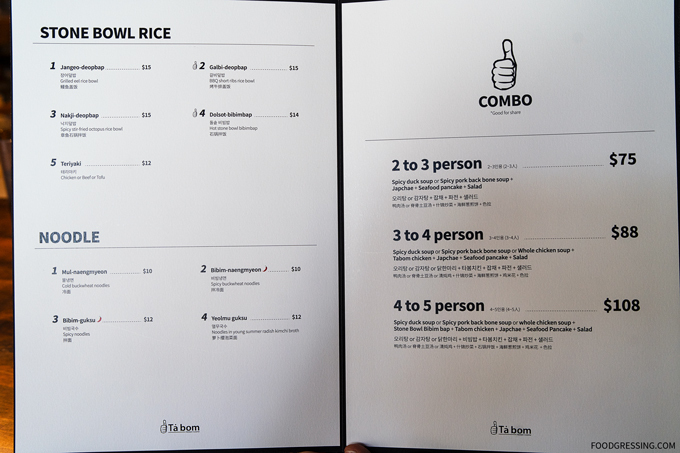 The manager apologized for the delay, cancelled the order, and gave us a few coupons for a few dollars off on our next meal at Ta Bom. 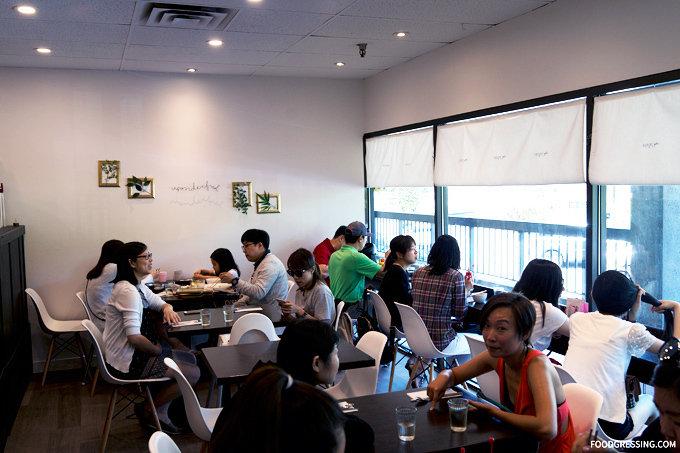 Newly opened in the Lincoln area of Coquitlam is a home-style Korean cafe, Cafe Sobahn. 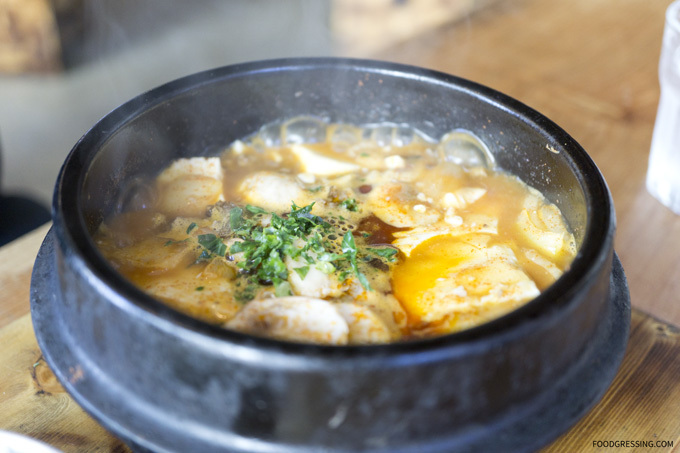 Owned and operated by a husband-and-wife duo, Cafe Sobahn focuses on simple yet hearty Korean noodle and rice dishes. 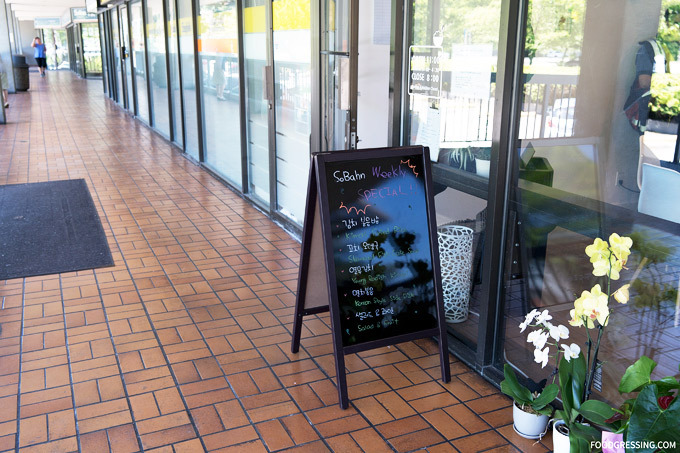 The owner was inspired to name the cafe “sobahn,” which means small dining table in Korean, based on memories of her mom using the table to make dumpling and rice cakes. I was recently invited for a tasting at Cafe Sobahn. Here’s a look at what you can expect. 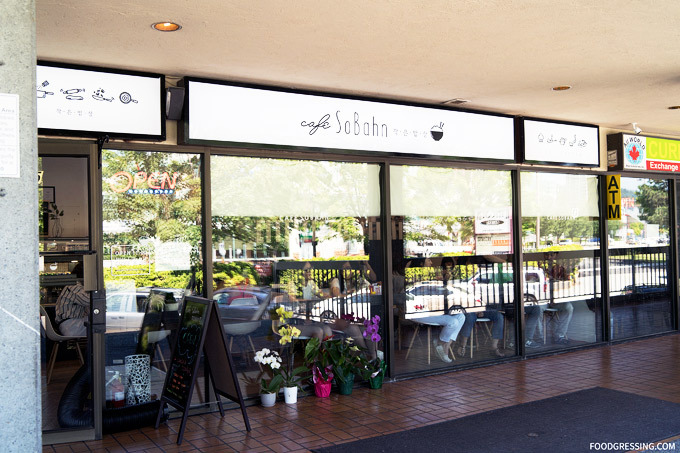 The simple, modern interior of Cafe Sobahn features seating along the window as well as two person dining tables. I visited during a weekday lunch and the cafe was essentially full with even a small lineup at the doorway. 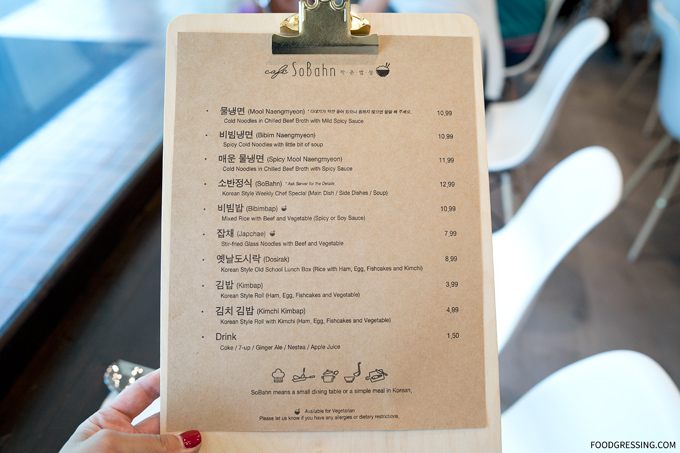 Cafe Sobahn’s simple yet focused menu features mains like cold noodles, lunch sets and rice bowls priced around $11-$13. 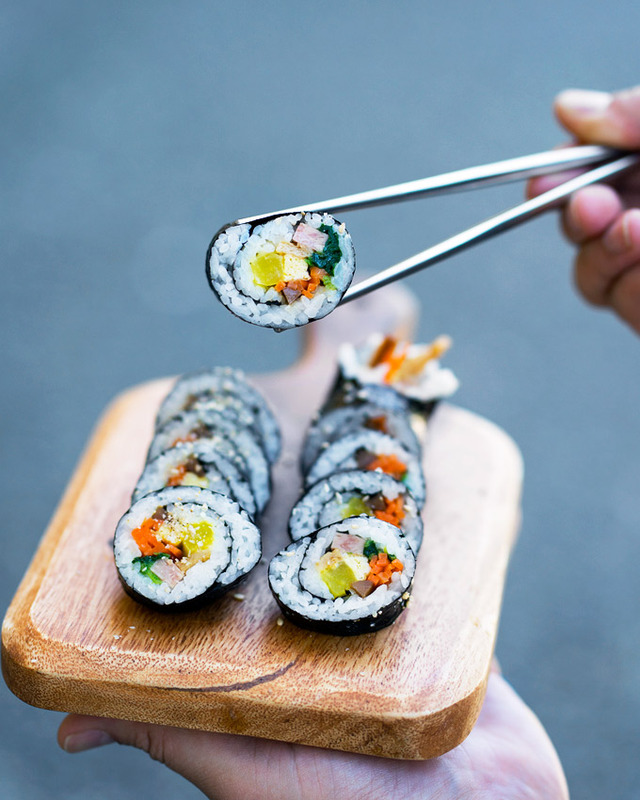 You’ll also find Korean-style roll ($4-$5). 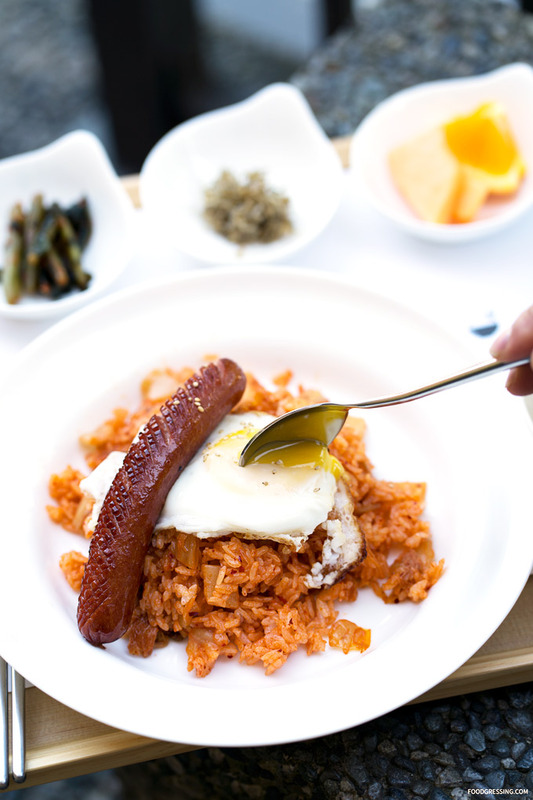 To start, I had Korean Style Weekly Chef Special ($13) featuring Kimchi fried rice topped with a poached egg and sausage. 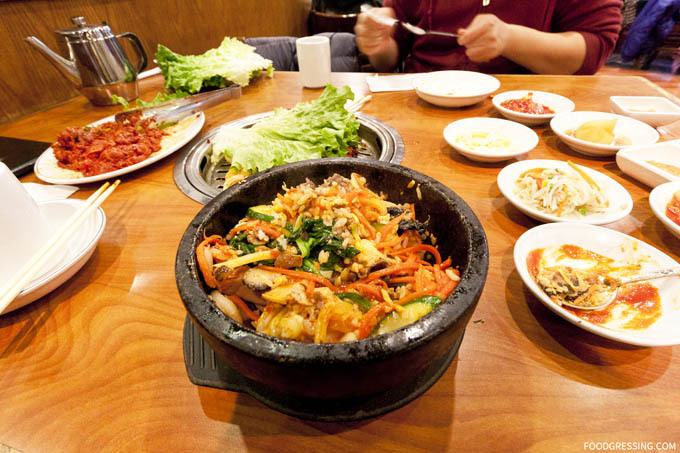 Side dishes included a salad, fruit, dried anchovies and fish cake soup. A filling and comfort lunch set where flavours were generally mild. The Korean Style Roll was stuffed with ham, egg, fishcakes and vegetables ($4) and had a nice clean, taste. 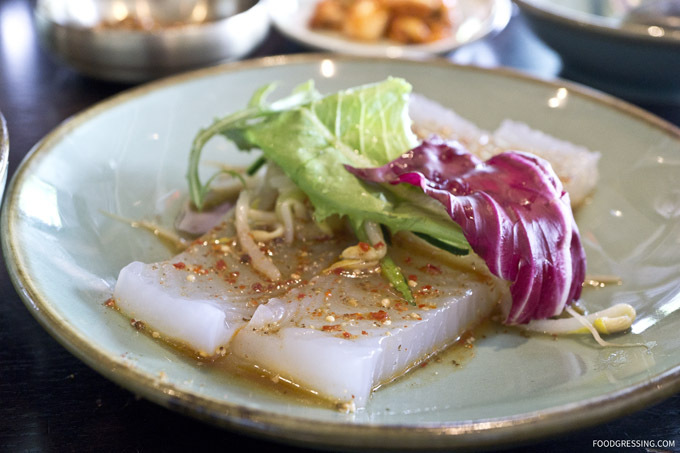 For a lighter, refreshing meal in the summertime, a recommended try are the cold noodles in chilled beef broth in a mild or regular spicy sauce ($11-$12). Topped with a hard-boiled egg. 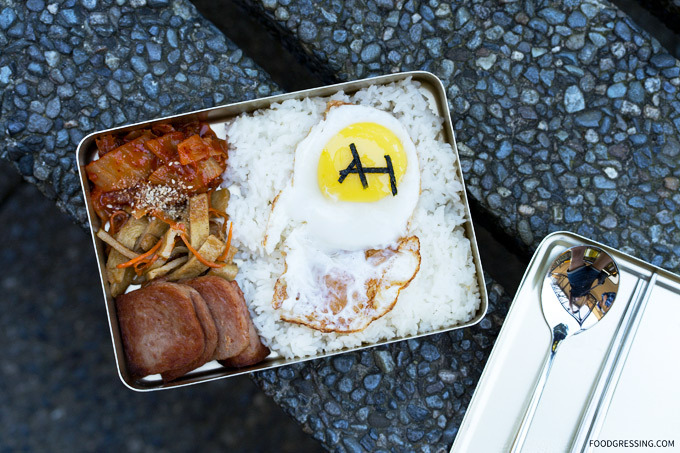 I very much enjoyed the retro-inspired Korean Style Old School Lunch Box ($9) featuring rice with ham, egg, fishcakes and kimchi. 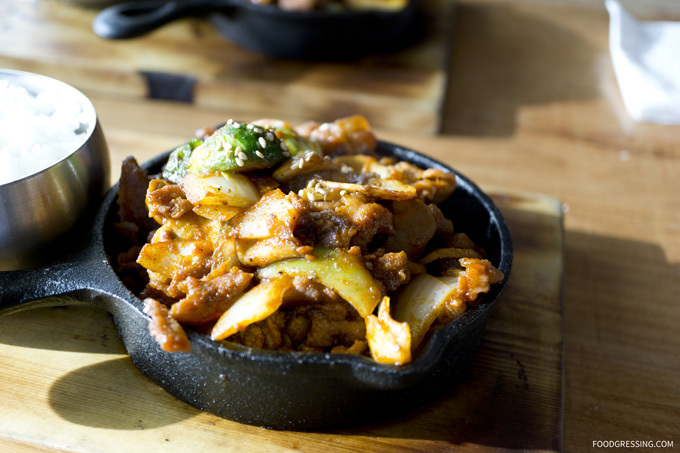 I quite enjoyed the home-style Korean dishes which were simple but had comforting flavours. 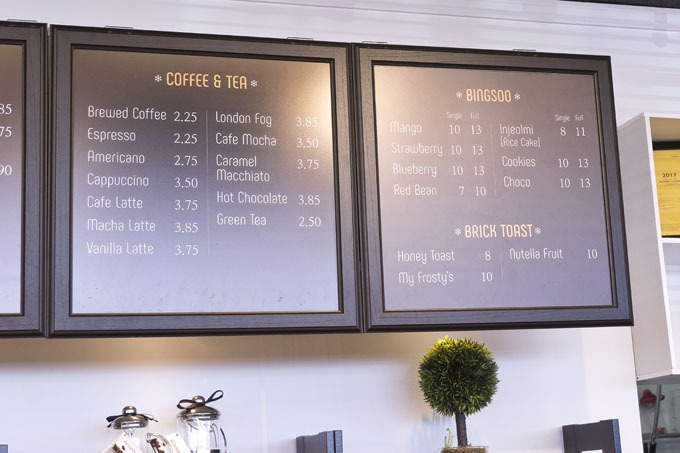 The cafe is new but seems to have gained quite a popularity with locals. 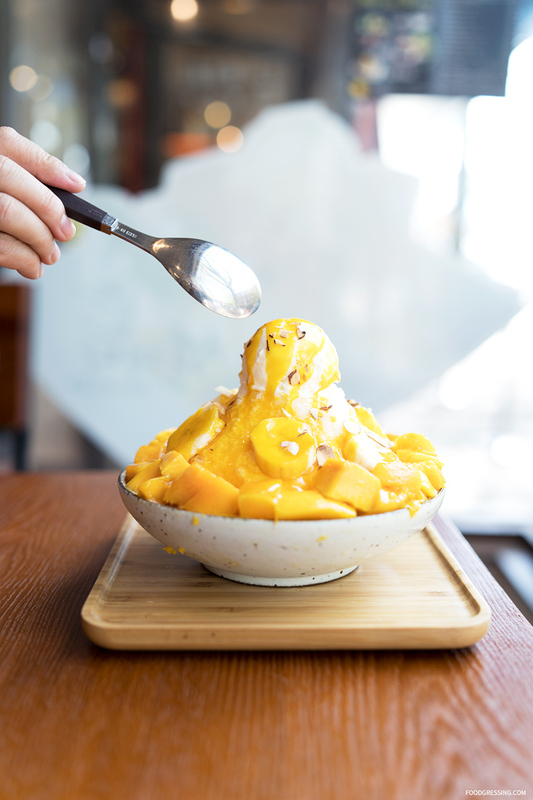 ‘Tis the season for shaved ice desserts and a new Korean dessert cafe opened in East Vancouver a few months ago. 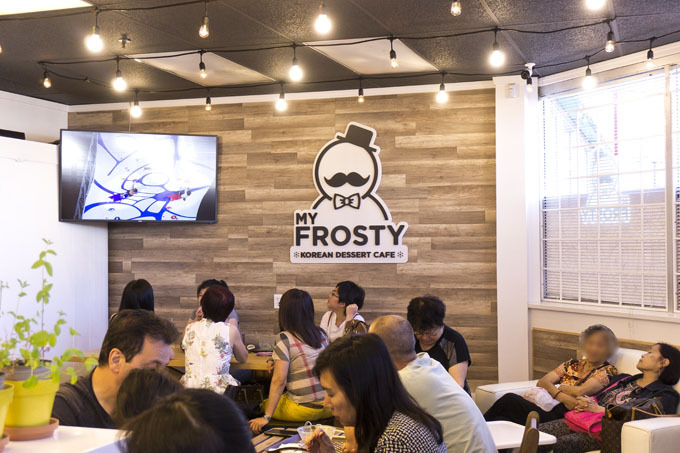 New to the dessert scene is My Frosty which specializes in shaved ice dessert or bingsoo (also known as “patbingsu” or “bingsu”). Looking to cool off from a warm summer day, I visited My Frosty with my family to try a few of their desserts. Disclosure: None of the food in this review was complimentary. The review was done anonymously. 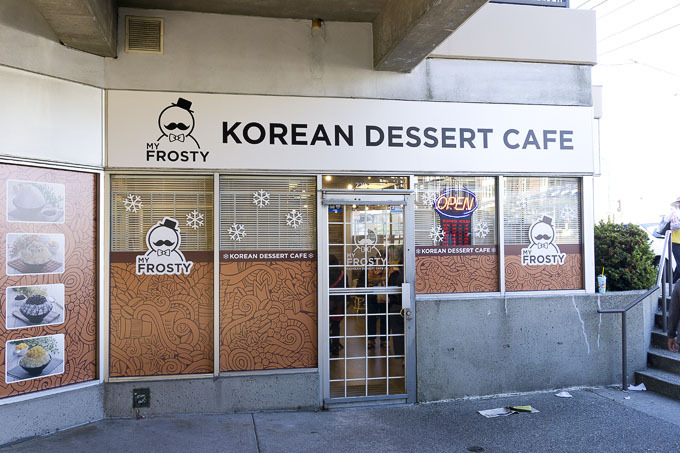 My Frosty is located on the second level of First Avenue Marketplace (East 1st and Renfrew). The interior of My Frosty seemed modern, clean and bright. There are tables to accommodate groups of 2 or more and even a sofa. 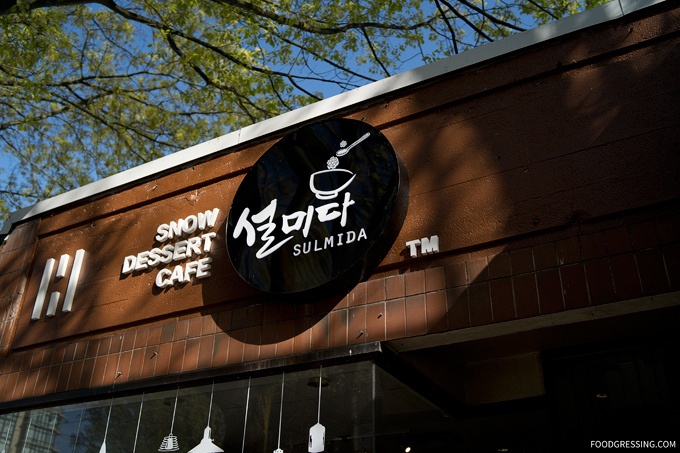 My Frosty offers bingsoo in single ($7-$10)or full sizes ($10-$13). 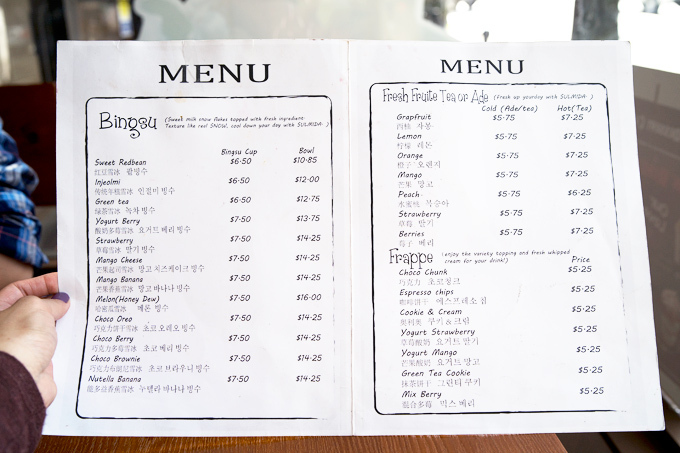 Flavours offered include mango, strawberry, blueberry, red bean, injeolmi (rice cake), cookies and choco. 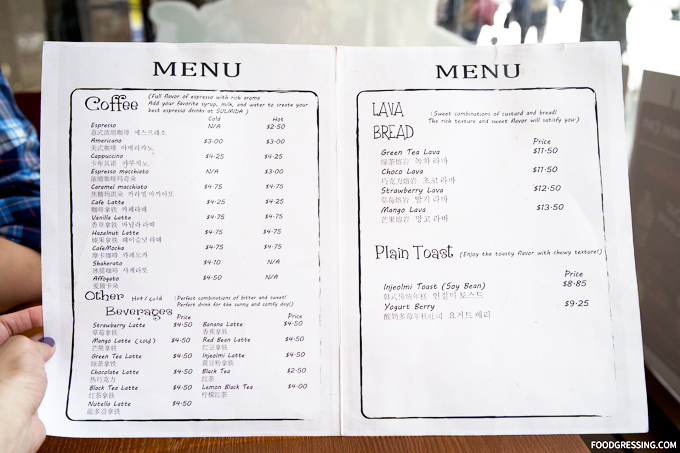 They also have brick toast, fresh ade, coffee and tea available. We ordered a single Choco bingsoo ($10) as well as a single Mango bingsoo ($10). 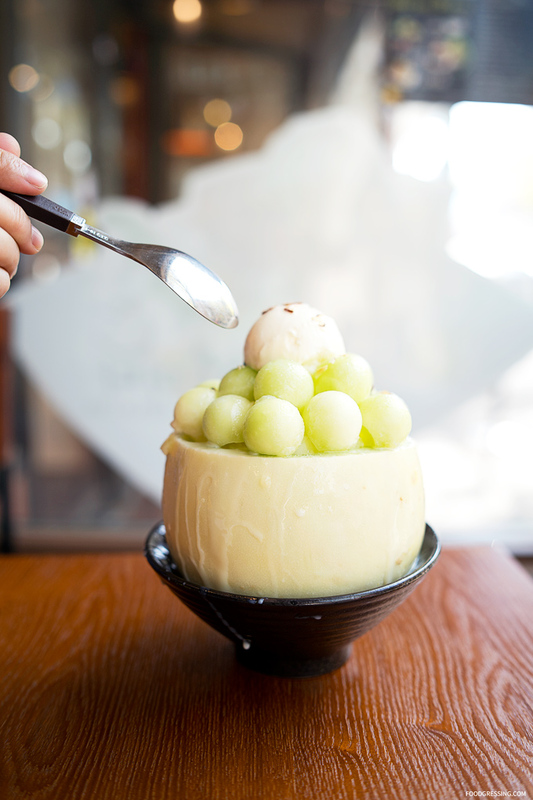 For both desserts, the shaved ice was textured as well as light and fluffy. There were cornflakes at the bottom which added a pleasant crunchy texture. I thought the portions were very reasonable for the price and two people could easily share a single size. 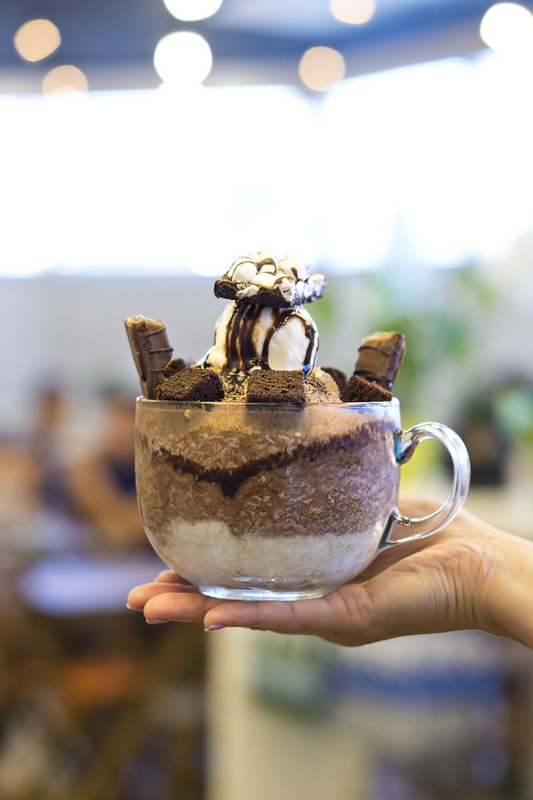 The Choco bingsoo had a few different toppings include Twix bars, brownie bites, vanilla ice cream and a chocolate bar with marshmallows and chocolate drizzle. I thought the brownie bites were pretty good being soft and not overly sweet. Twix is not really a favourite of mine and I didn’t want to eat the marshmallow bar either. 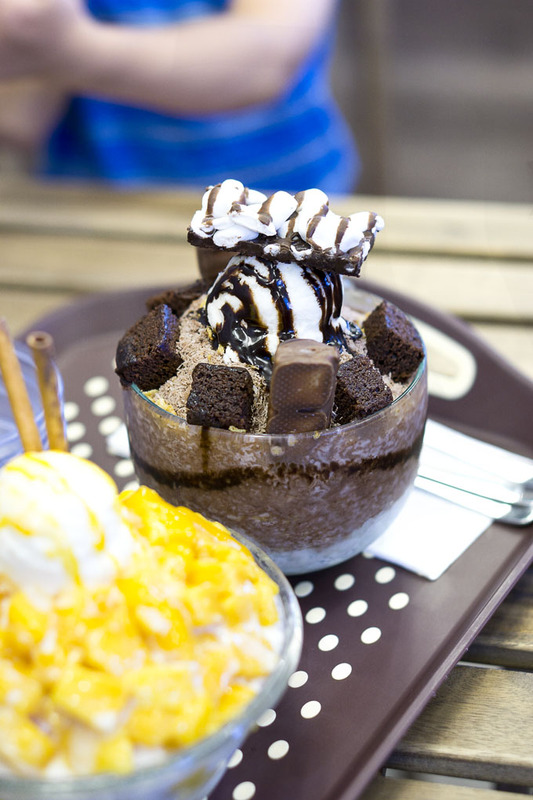 But otherwise, the Choco bingsoo was satisfying and I would have it again. 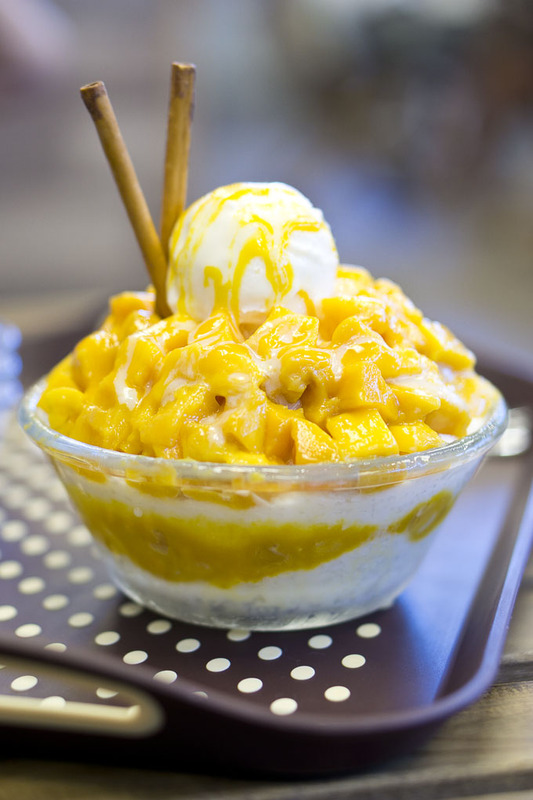 The Mango bingsoo didn’t disappoint and had a good amount of mango pieces. The mango was reasonably sweet and not too tart. The dessert also came with a scoop of ice cream and two Pocky (?) sticks. I ran into Maggi (vieamaggi.com) who had also decided to visit My Frosty coincidentally. 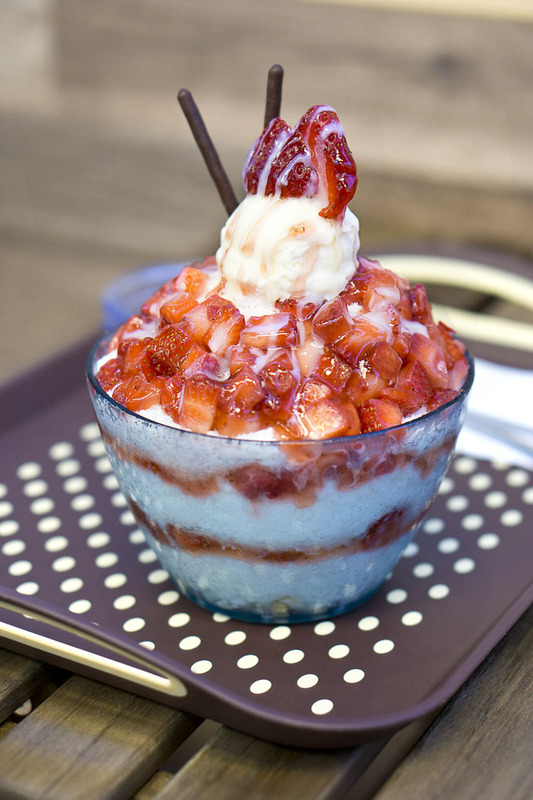 I sampled a bit of her Strawberry bingsoo and thought it was pretty good. I prefer mango flavour personally but for a fresh fruit bingsoo the strawberry version was OK. The strawberry one came with two chocolate Pocky sticks. 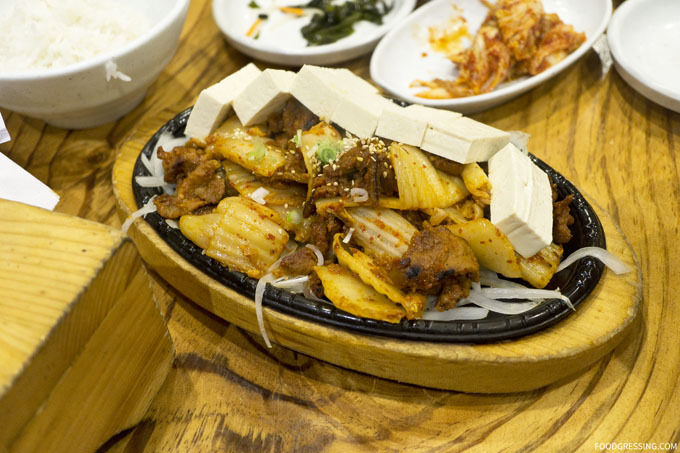 Sura Korean Restaurant is known for their affordable lunch sets which includes a wide number of dishes. 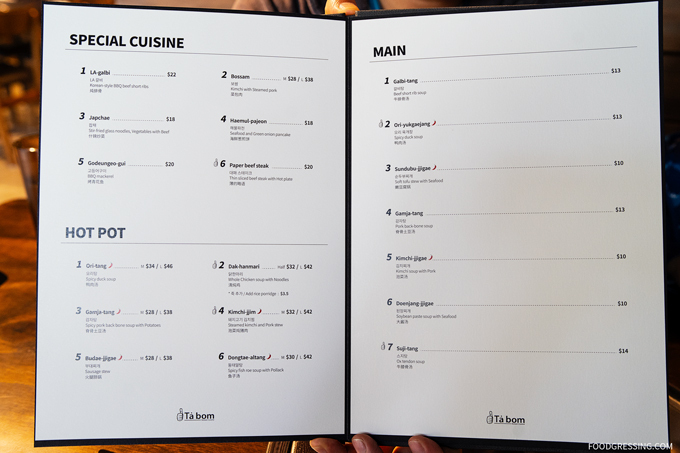 They offer a $15 set menu featuring 11 dishes and 3 sides as well as a $20 set menu with 13 dishes and 3 sides. For each lunch set, the menu requires a minimum of 2 orders and the set is available to order until 3:00pm daily. Last year (working through my backlog here! ), my husband and I tried out their $20 lunch set at their Robson location. Note: This is not a sponsored post. This meal was not complimentary. I did not receive any compensation or incentive to share about my experience. The restaurant did not know that I am a blogger. However, the items are subject to change. The House Special Spicy Seafood has stir-fried squid and masago (at least) with spicy house special sauce. 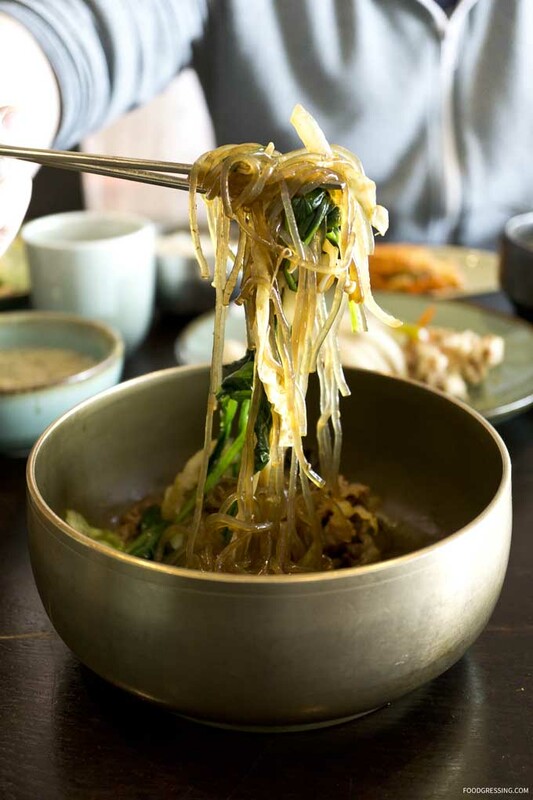 The Tang–pyungchae or mung bean salad was gelatinous and essentially tasteless. It was flavoured with a spicy sauce. Bossam or braised pork belly wraps had the pink pickled radish as the wrap. 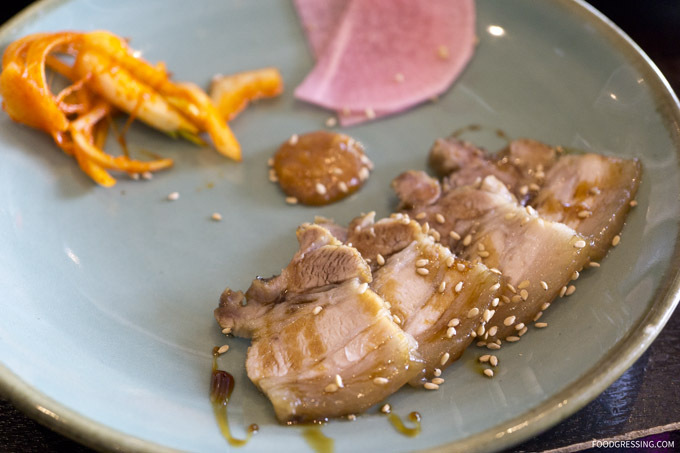 The pork belly pieces were tender and fatty and had sesame seeds on top. There was also some kimchi and a spicy paste that you could add to the wrap. 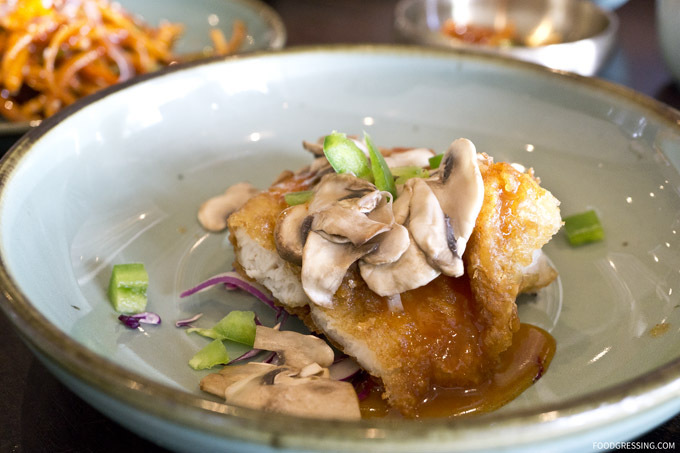 The Mackerel Jorim or deep fried basa fillet had crispy, breading on the outside and tender fish on the inside. 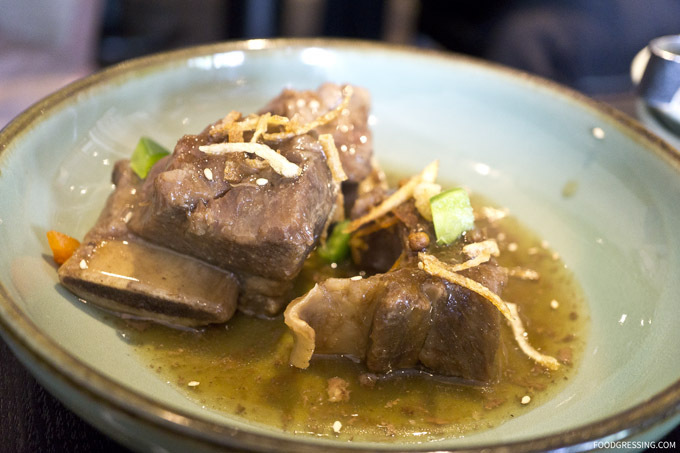 The Galbi Jjim or braised beef short rib were very tender. 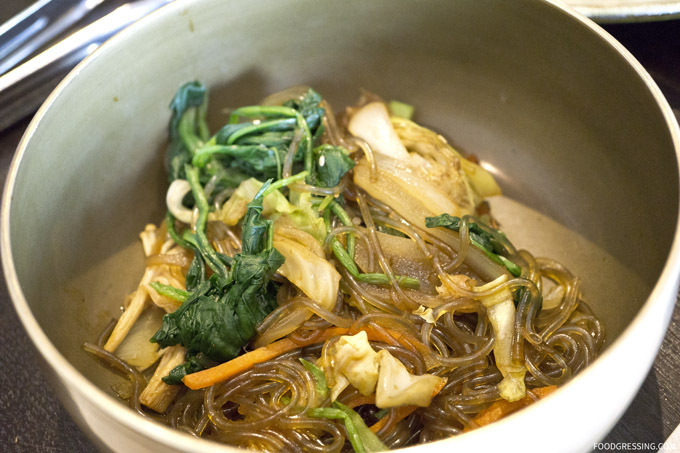 The Japchae or Korean glass noodle stir fry with meat and vegetables was a little savory, sweet and nutty. 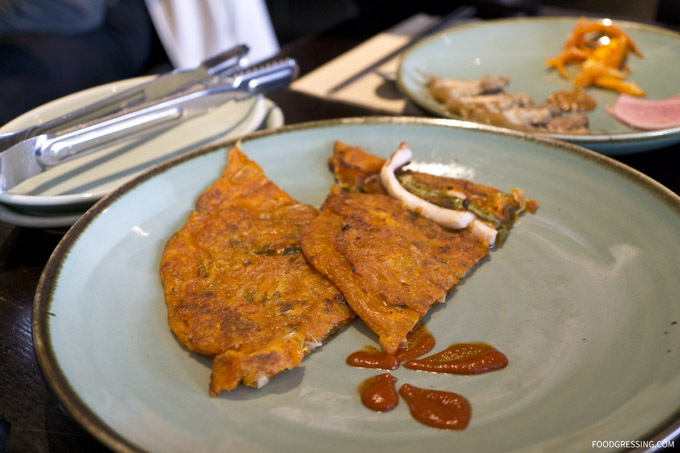 The potato pancake was crispy but a bit too greasy. 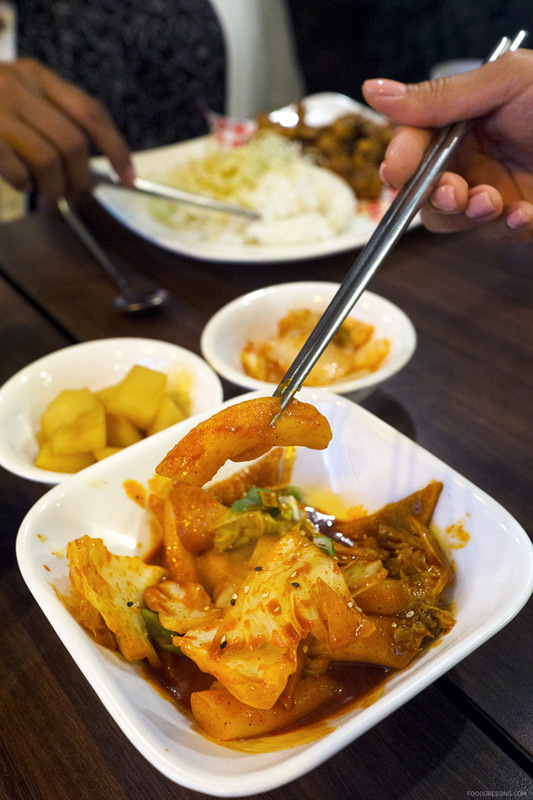 The Doenjang (Korean Stew) has tofu, veggies, and kimchi. Just enough spice to tickle the tongue. The Jeyuk bulgogi (pork) was nicely spicy, had good flavour and was tender. The Tang Sooyuk (pork with sweet and sour sauce) were nicely cripsy on the outside, tender on the inside and tangy in flavour. The Korean rice punch was a wonderful sweet finish to the meal. 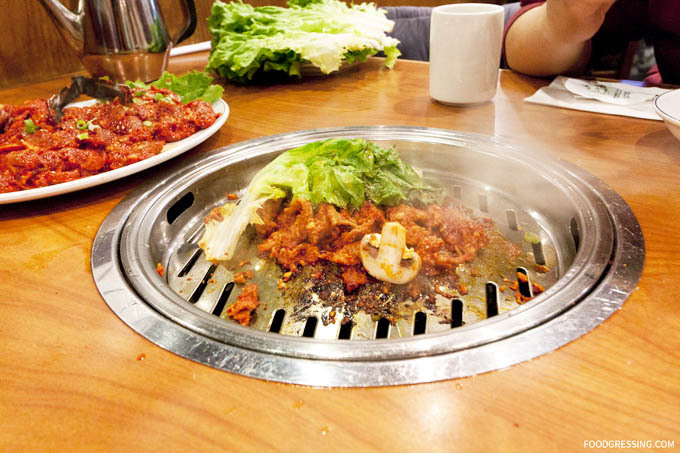 A few weeks ago, my family along with another friend decided to visit K-town in Burquitlam for a food adventure. 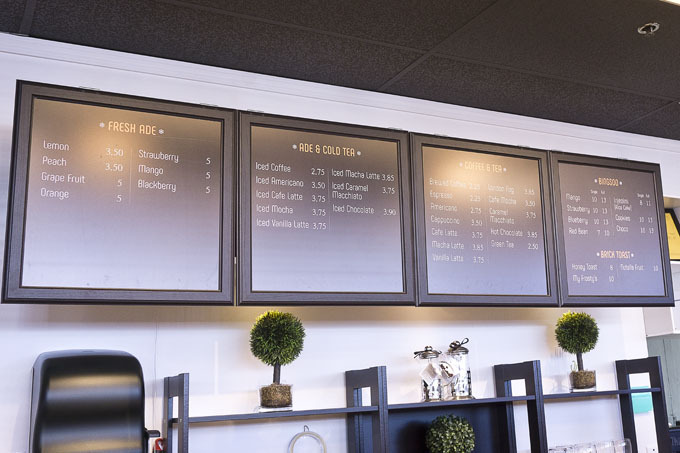 With a dessert-first mentality, the main focus of our trip was to visit Standing Egg Coffee for coffee and treats. 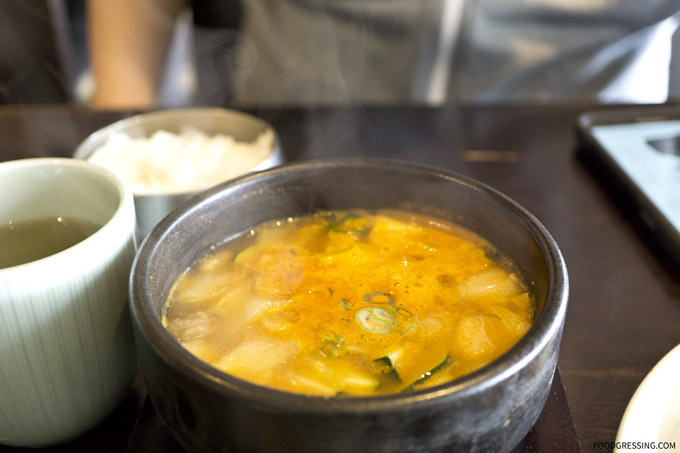 Working backwards from sweet to savoury, we then proceeded to House of Tofu Soup for some comfort foods. 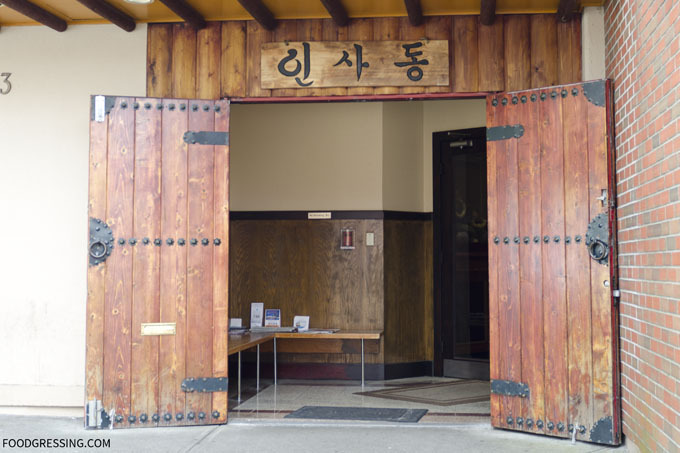 My friend was particularly eager to visit House of Tofu soup because she had been a fan of their food at their now-closed Richmond location. The interior of House of Tofu Soup was more inviting and comfortable than I would have expected. I liked the wooden tables with glossy finishes which made the space seem more elegant. The restaurant is not so much a hole-in-the-wall. Its is rather spacious with many dining tables suited for small (~4 ppl) or large (~8) groups. The restaurant is kid-friendly with many families dining together. 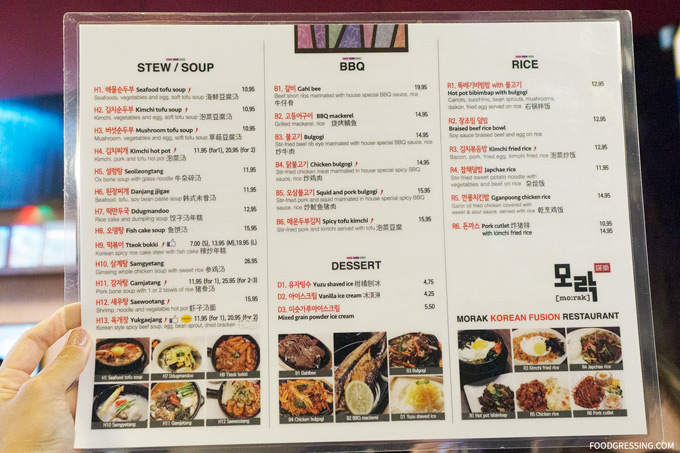 House of Tofu Soup offers many Korean comfort foods including their build-in-your own tofu soup, stews, bibimbaps, bulgoghi, seafood pancakes and more. 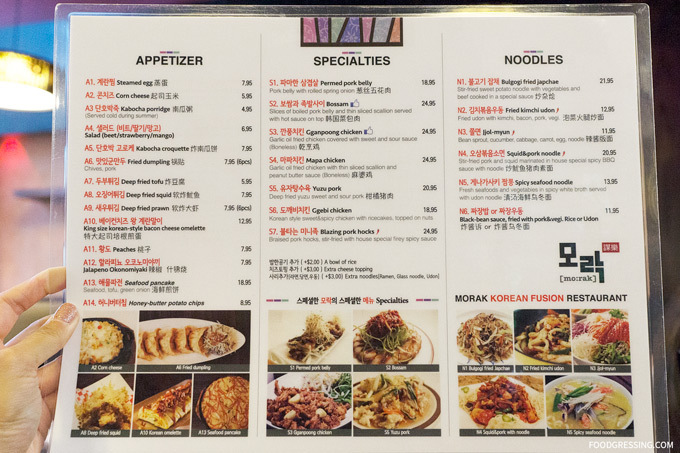 I would say the pricing is average for a Korean restaurant in Metro Vancouver where an average meal for one person is about $15-$20. 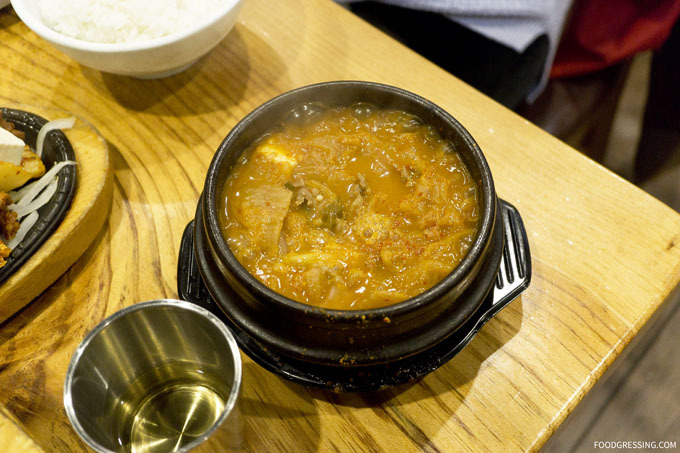 My friend had the Kimchi stew which was simmering in a claypot when it arrived at our table. She chose beef for the protein and it came with asssorted seafood and veggies. My friend loved the spicy flavours of the stew and it was a dish she had enjoyed at their Richmond location before. 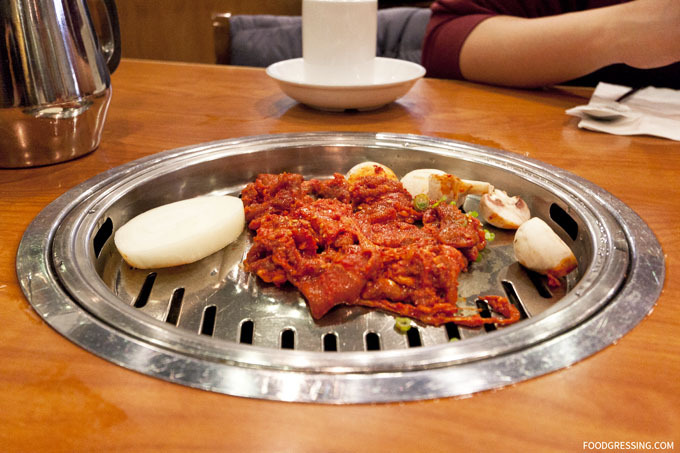 Aside from poutine and butter chicken, my third go-to comfort food is pork bulgoghi. 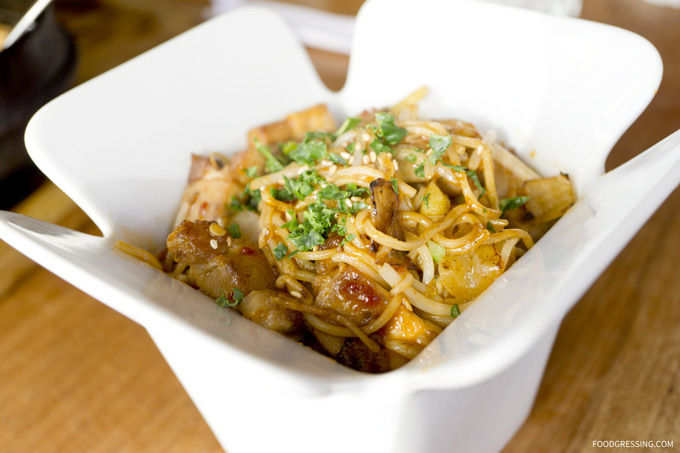 House of Tofu’s version is sold with tender pork and all the right sweet, savoury and spicy flavours. I’d say I still like the version from Damso the best which is just a bit more flavourful. 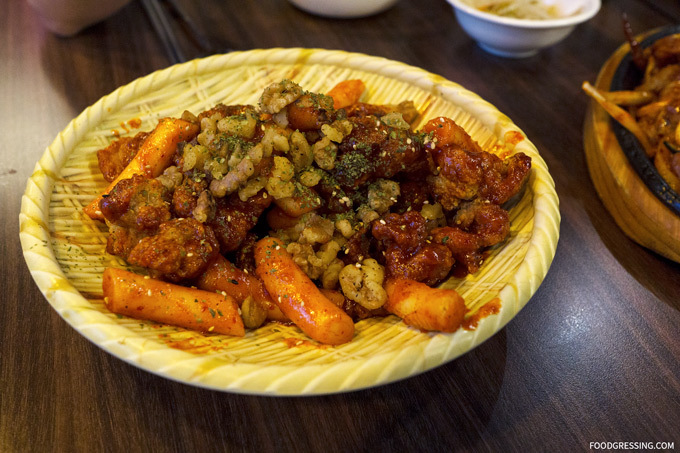 We also had jae yook which is kind of like the bulgoghi but more spicy since it is cooked with chilies and kimchi. I like the soft tofu on the side which you’ll enjoy as a palate cleanser. The seafood pancake was good too. It was crispy along the edges and soft and slightly gummy in the middle. The pancake had a decent amount of squid and scallion. 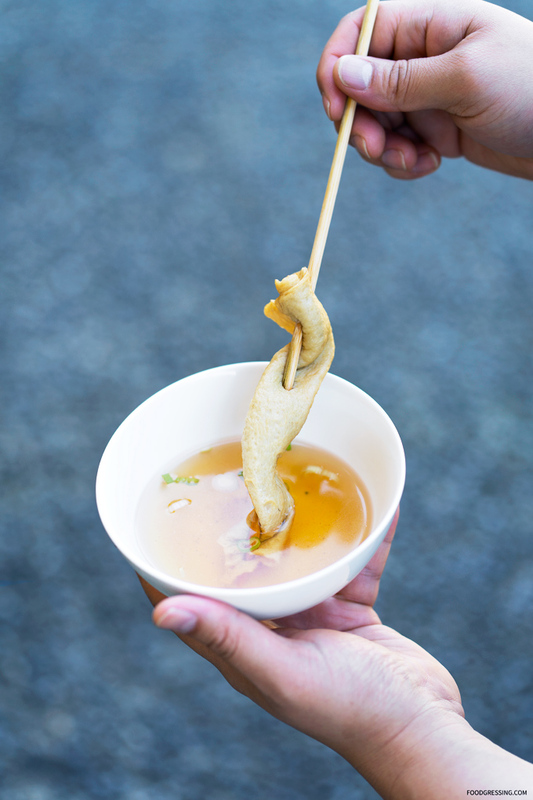 The squid offers a nice, crunchy and meaty texture to the pancake. 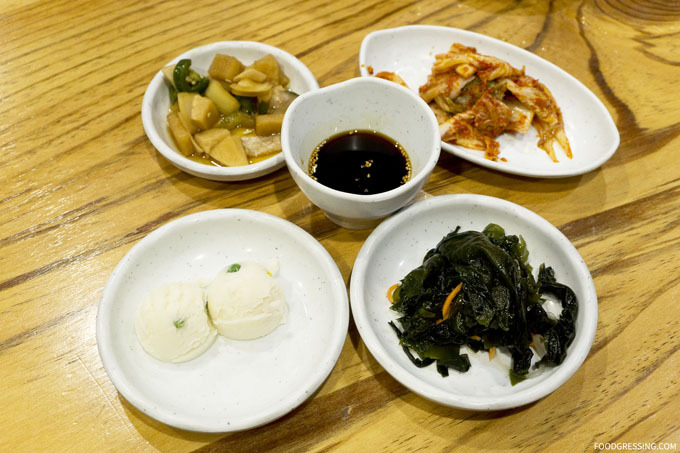 For side dishes, there was kimchi, seaweed, mashed potatoes, pickled veggies and cucumber. And with regards to the rice, it is served in a stone bowl. The best part is the crispy rice at the bottom to which you can add tea to soften it up. I’d say service was above average for these types of establishments. The Korean server ladies were attentive, friendly and refilled our glasses during our meal. I was first introduced to Insadong back in 2009 when my former colleague, who is from Korea, recommended the place. 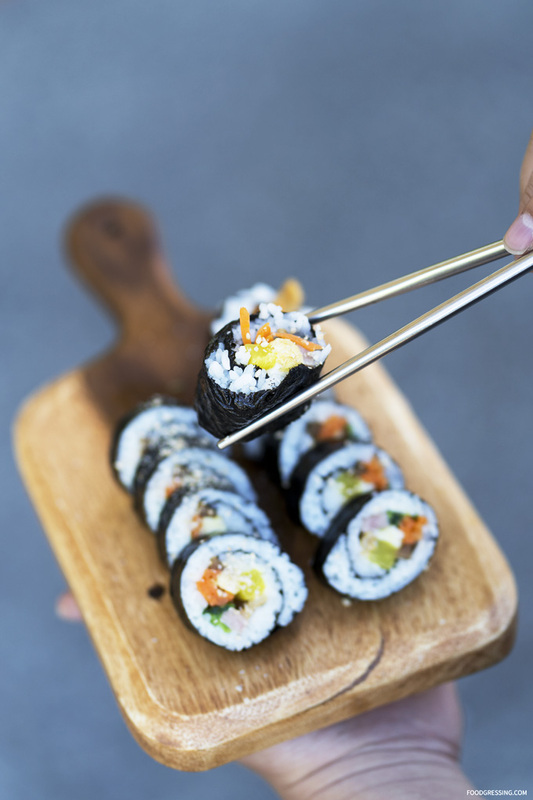 Despite the surge in new Korean restaurants since then, they have remained opened in business. 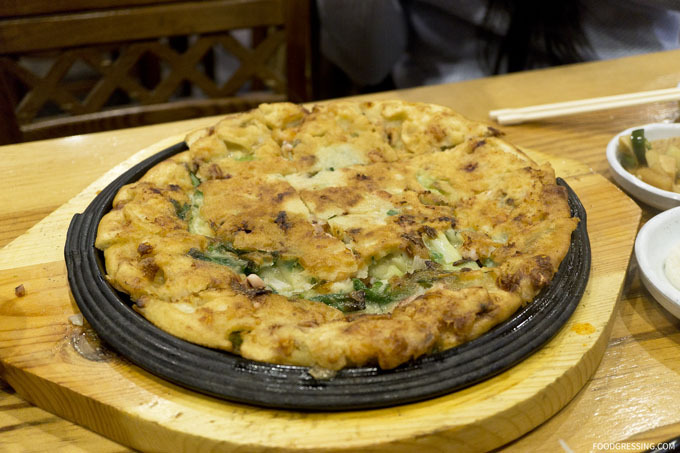 Over the years, I have visited Insadong a few times and this review is a culmination of all those visits. 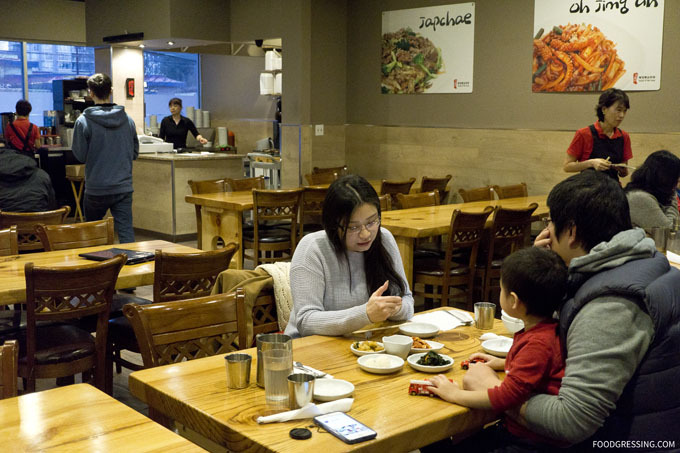 As a West End resident, I am a regular at small Korean restaurants on Denman. On the other hand, Insadong is great for large groups and parties. The restaurant itself is very spacious and they have multiple party rooms which is great for large groups. My experience with service is that it is bare minimal. It really does depend on the server and how busy the restaurant is. 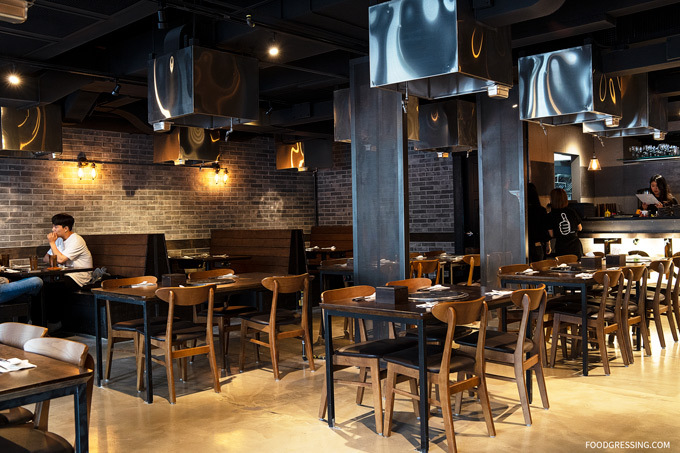 Some servers are more proactive in changing the grill while some you need to call upon them with the buzzer located on the table. For the times when I did not do the Korean barbeque and only had bibibamps which are cooked in their kitchen, the servers just gave us the food and left. 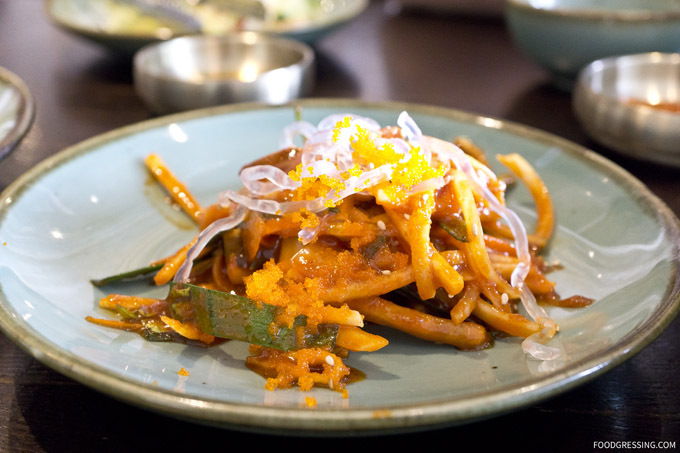 The banchan served at Insadong includes picked vegetables like cucumbers, bean sprouts, radishes, potatoes and kimchi. 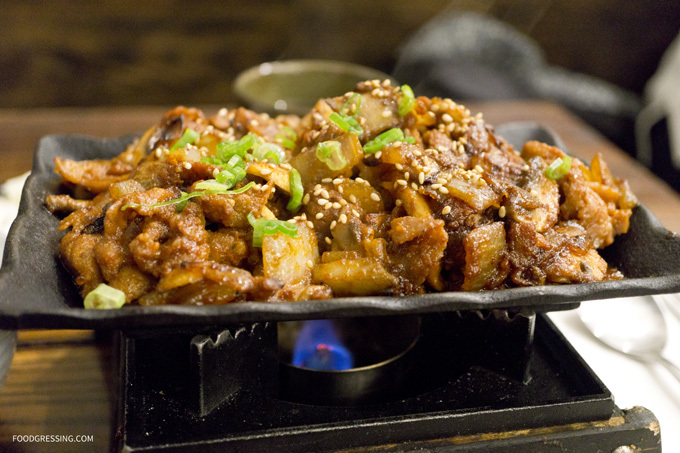 I had their Korean barbeque combos on a few occasions and the spicy bulgogi is my favourite. 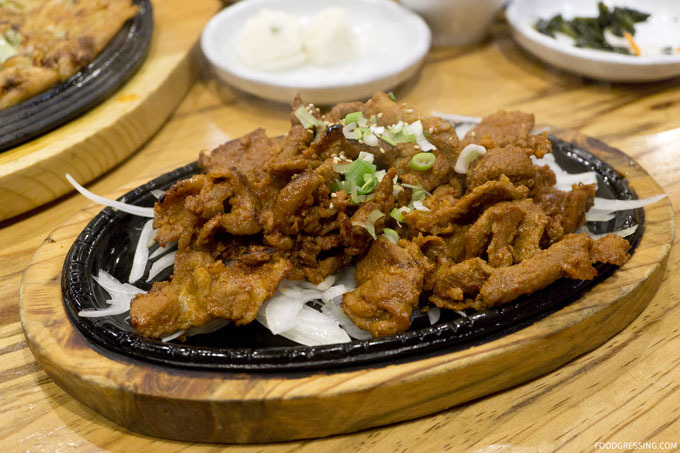 Sweet, savoury, juicy and tender – Insadong’s version of this popular Korean marinated beef dish does not disappoint. 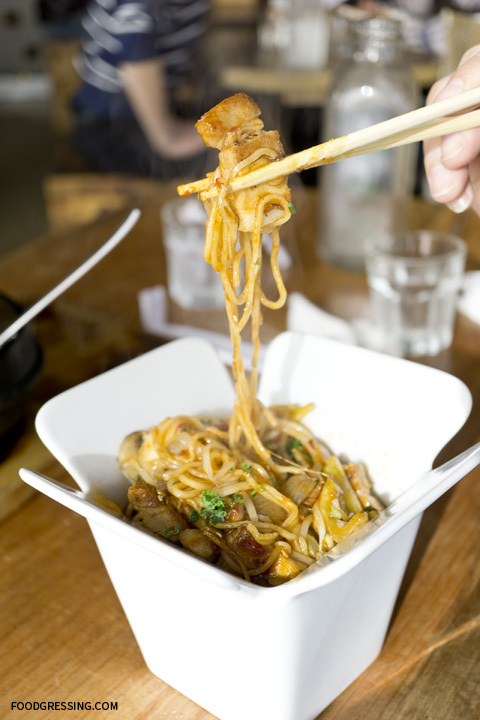 The bibibamps (hot stone bowls) are delicious options. 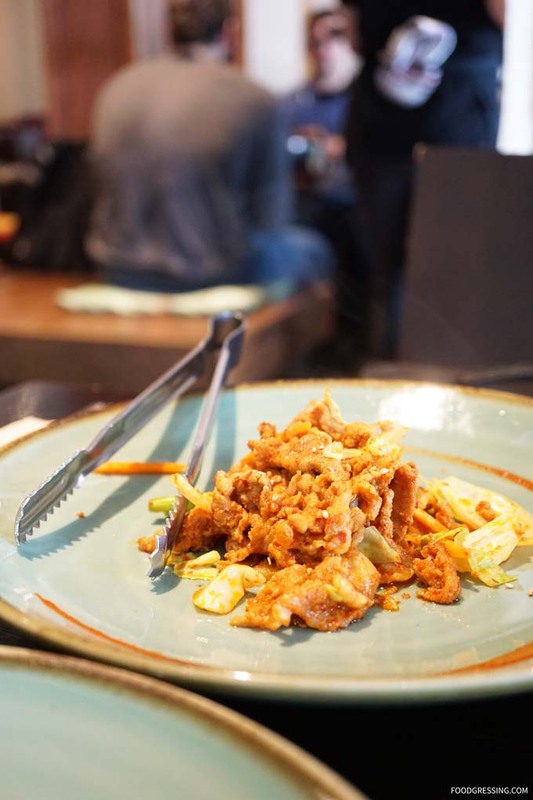 The ingredients come in a sizzling hot stone bowl and you can mix everything with a touch of fermented bean paste when it arrives at your table. 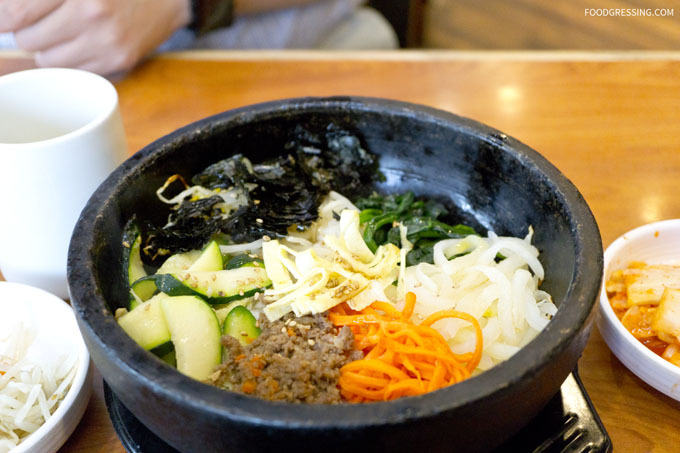 I have had their regular bibimbap with assorted vegetables and beef twice and have enjoyed it. The crispy crust that forms when the rice touches the hot stone is absolutely heavenly. 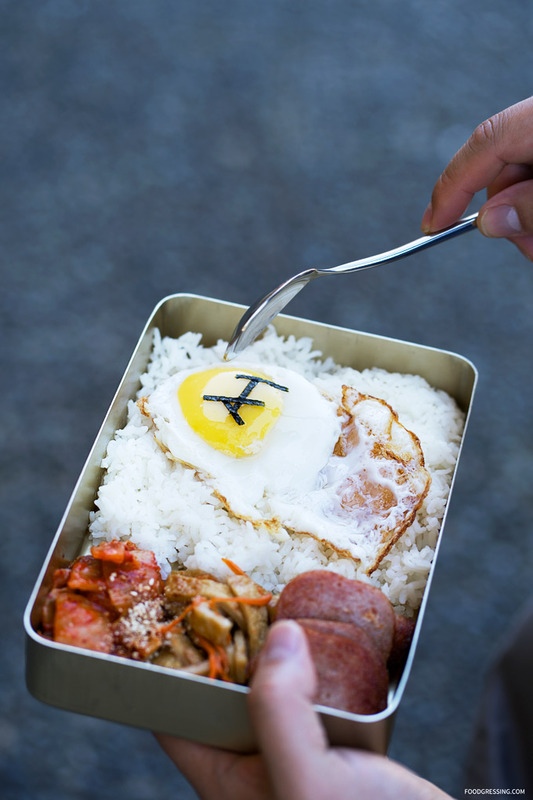 When you mix in the crispy rice with the soft rice and ingredients, it is quite the comfort food that is nourishing, flavorful, fun in terms of textures and healthy. 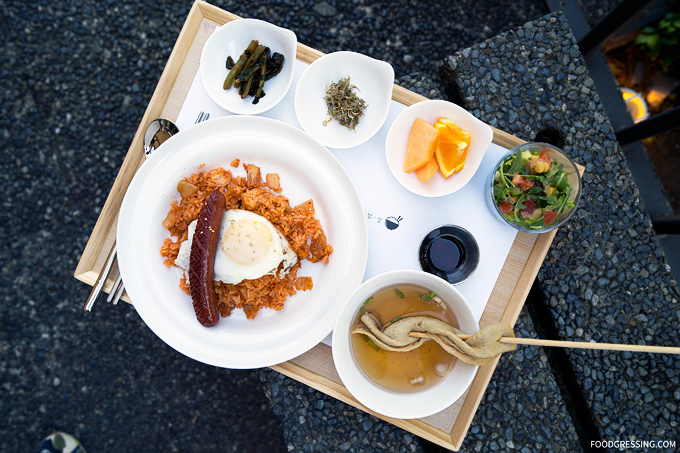 If I must recommend a bibimbap, I must recommend the most expensive one ($11.99) one. 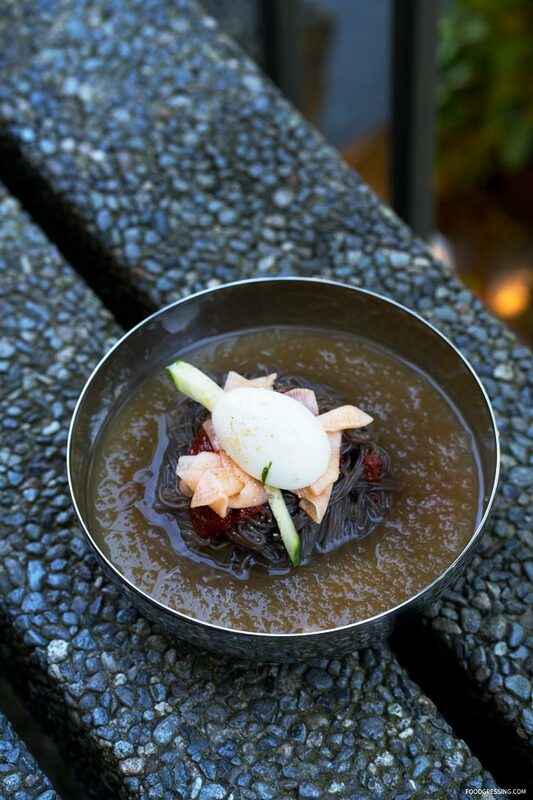 It is a more seafood-inspired one with scallop, shrimp, shitake mushrooms, pineapple, masago with seasoned soysauce. 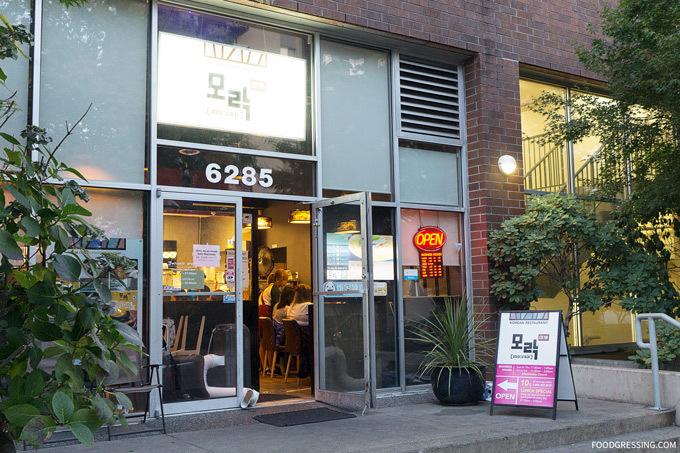 If you are looking for a good Korean restaurant in Downtown Vancouver, Denman and Robson is the area to be. 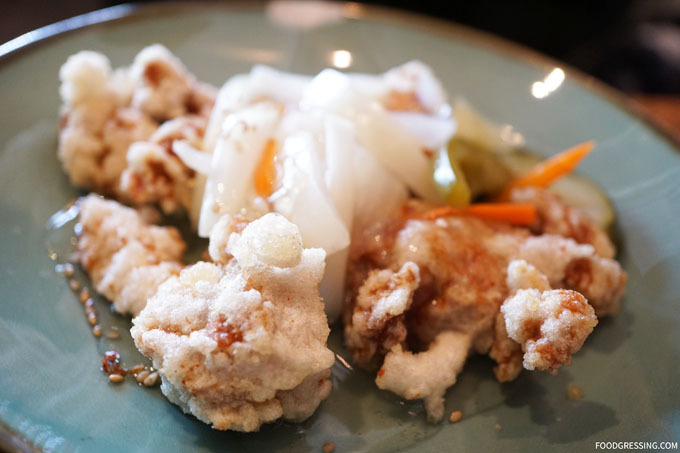 Ma Dang Goul is one that I have been to, and recently I tried Damso Modern Korean Cuisine. 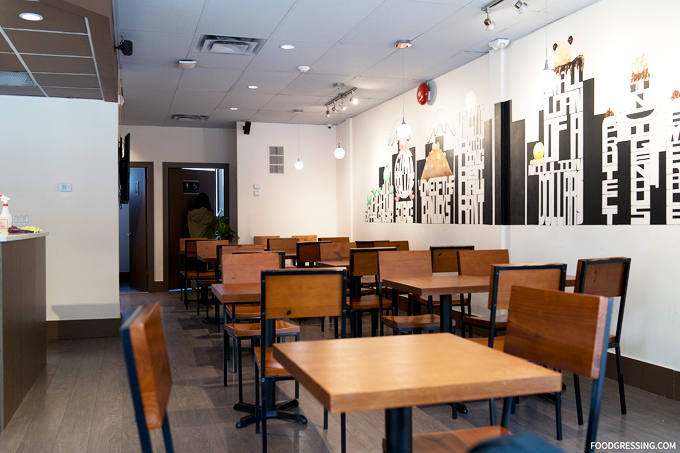 Damso has two locations (one on Denman and one on Bute) and has generally received favourable reviews. 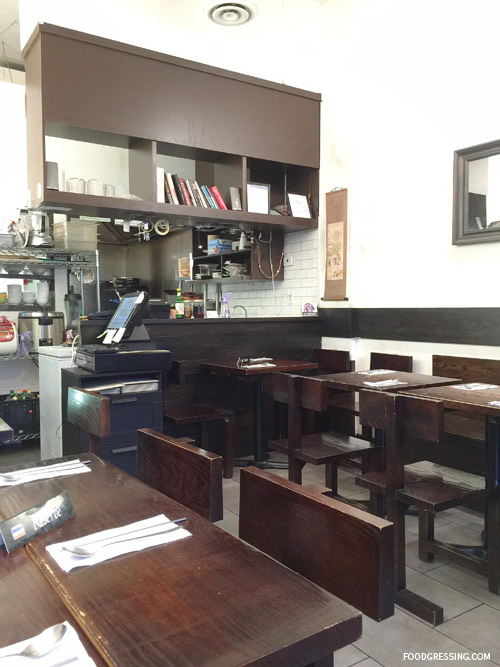 I visited Damso on Denman twice recently and in this post I will review my experiences. 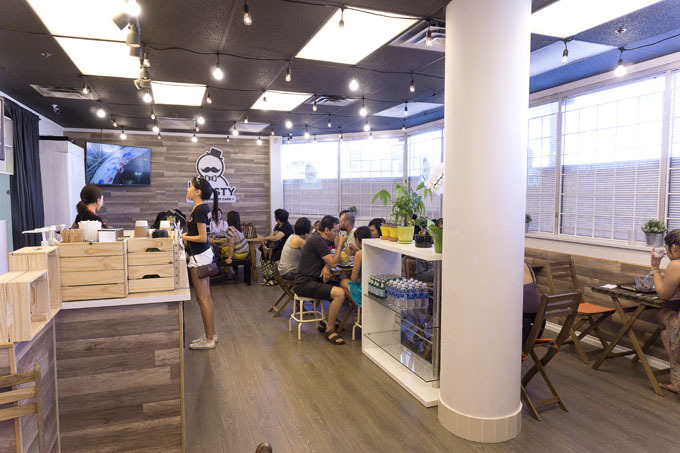 Damso offers a variety of comforting Korean eats including 18-Hour Braised Beef Tongue , Korean Miso Stew, Tok-Kalbee Meatballs and Kalbee Osso Bucco. The items typically range from $7-$15 dollars. 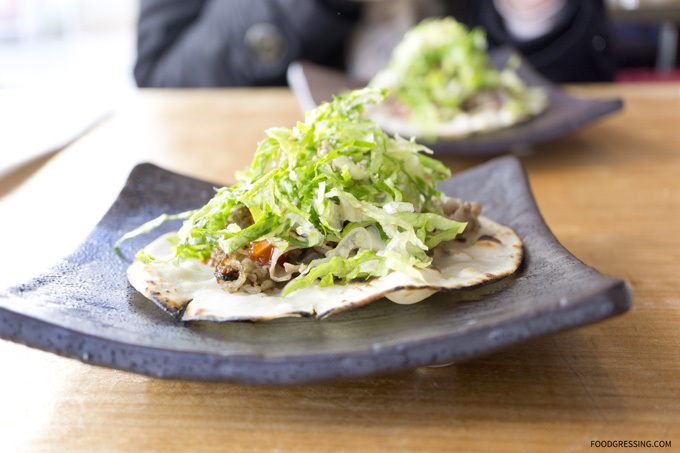 One of their more unique menu items is the Korean taco with secret gochujang chili sauce. The menu is available online via Zomato. Damso on Denman is by no means a large restaurant, but rather cozy and quaint. 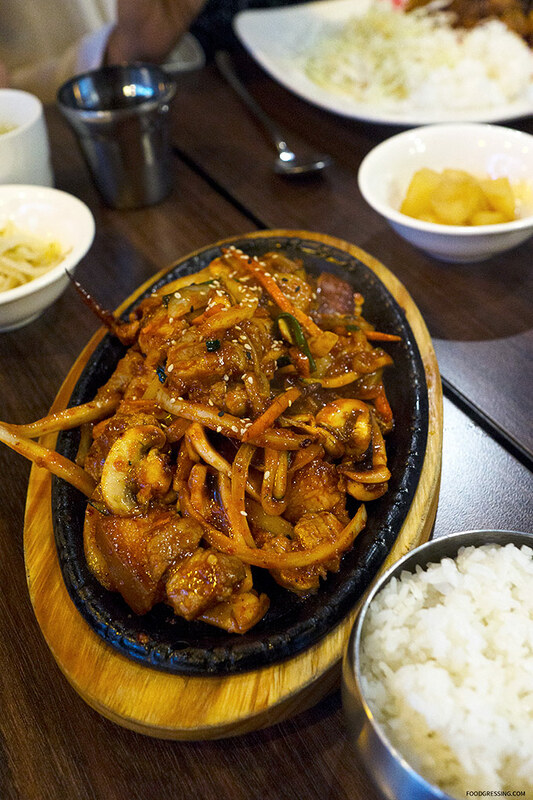 On my first visit, I had my favourite Korean dish which is spicy pork bulgogi for dinner ($11.99). I thought that Damso did a great job with the flavour – it was wonderfully sweet, savoury and spicy. The pork was tender and the sesame seeds sprinkled on top was a nice touch. 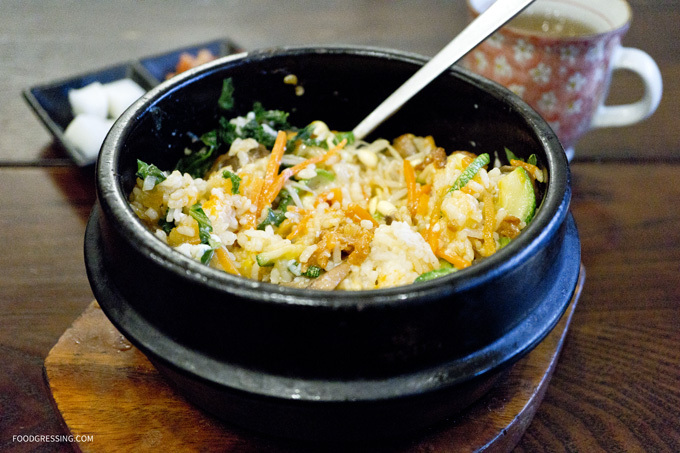 For my recent visit, I ordered a hot stone bibimbap, also one of my favourite Korean dishes. 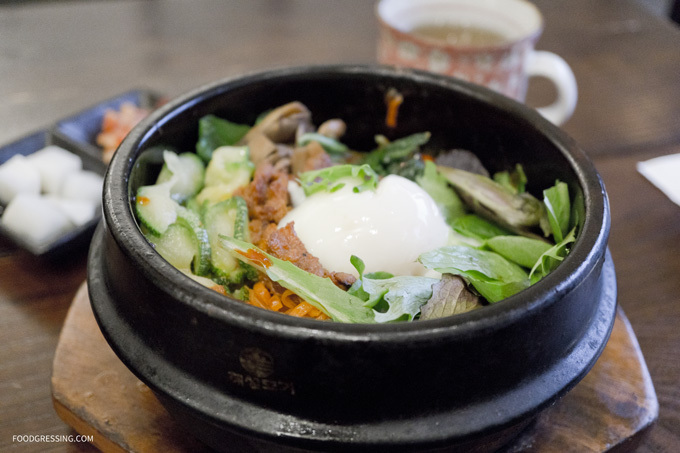 I enjoyed the spicy pork so much from last time that I decided to have it again with the bibimbap. 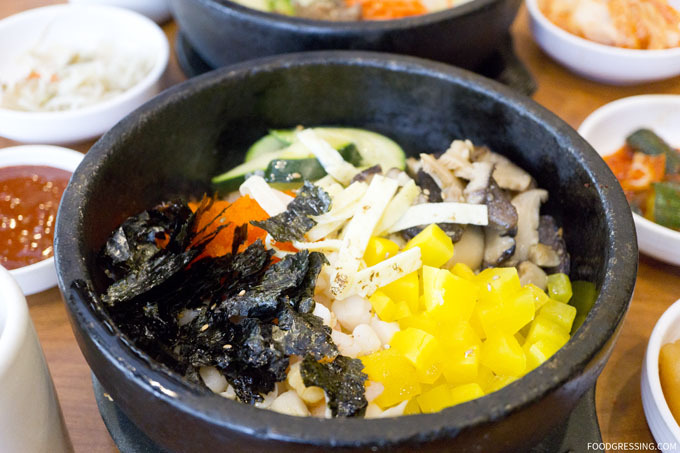 Other vegetables that came in the sizzling hot stone bowl were Korean bean sprout, carrot, zucchini, spinach, mushroom and egg. Not the best bibimbap I’ve had before locally. The one from Gyu-Kaku has more flavour but this one from Damso is still okay.